Typically, hostels don’t have a good rep. I’ve stayed at a few myself and oops… While I’ve stayed at some others and had a wonderful experience. I love the fact that I can actually get a single room with my toilet and shower inside the room. That’s big for me as I don’t like sharing my toilet and shower. But I’m rambling. Check out Kash’s book about Luxury European hostels. I think you’ll be amazed. 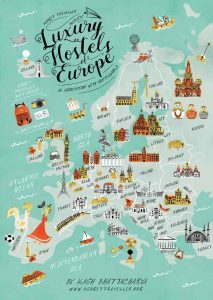 He did the first one 4 years ago and now its updated to include more destinations around Europe.